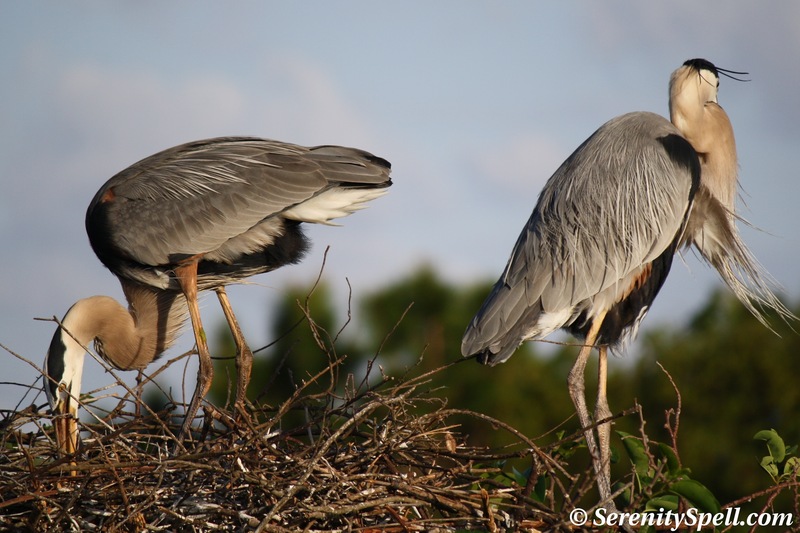 Nesting season continues at our protected wetlands, and the ever-graceful and regal Great Blue Herons consistently fuel the attentions of nature lovers and photographers. Now that Florida’s “Season” has ended however, the more timid (*me*) can enjoy these creatures. I haven’t written much on them, so here’s a bit of general info on the species. Great Blues — also known Blue Cranes, California or Florida Herons, Espiritu Santo Herons, San Lucas Herons, and Treganza’s Herons — can be found in North and Central America, as well as in the West Indies and the Galápagos. 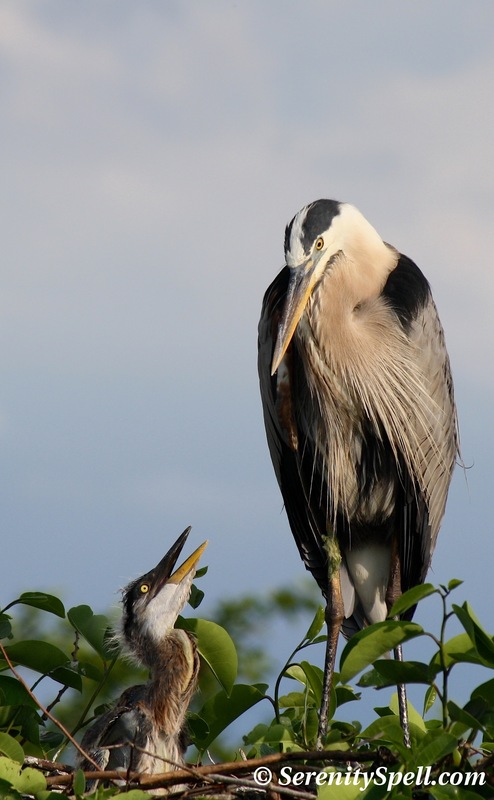 They’re the largest of the herons in North America, and globally their size is surpassed only by the Goliath Heron and the White-bellied Heron. At 4 feet tall, and with a wingspan of 7 feet, they’re a stunning sight in our swamps and wetlands, as they stalk the shallow waters with long and deliberate steps, and fly overhead with slow and strong wing beats. In flight, they tuck in their necks, and their long legs trail behind. Save for migratory and nesting periods, Great Blues hunt and travel alone. They’re typically found near the shores of open water and in wetland environments, in both saltwater and freshwater habitats — including marshes, rivers, lakes, bays, lagoons, coasts, shores, and ponds. 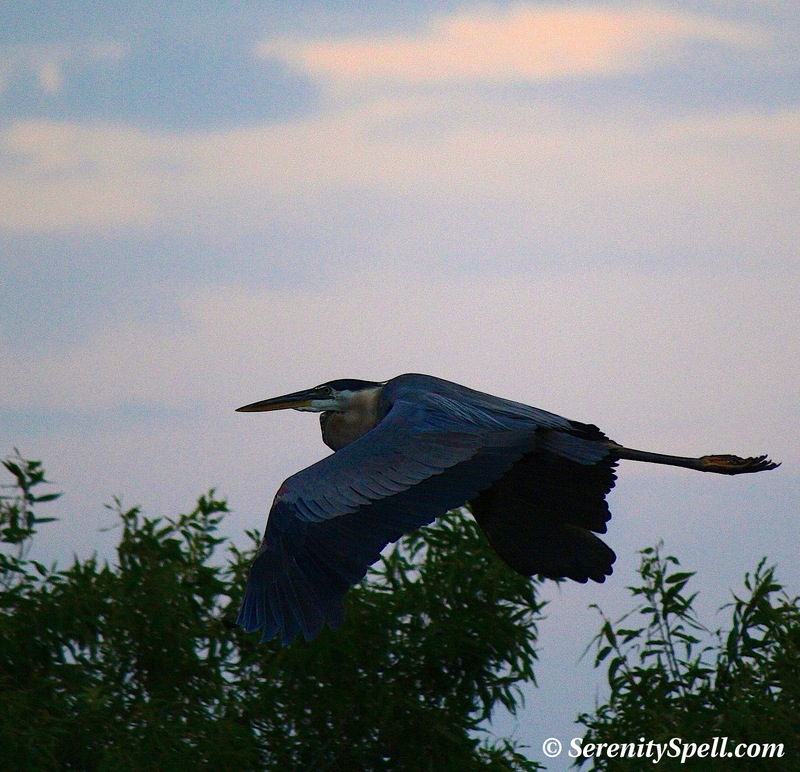 Like many other wading birds, Great Blues are primarily active at dawn or dusk, when fishing’s at its best. To observe them standing stock still, scanning and stalking the waters and surrounding vegetation for prey, is mesmerizing. Once they spot a fish, they strike with lightning-fast precision to grab or stab it — but they’ll also eat frogs, shrimp, crabs, insects, reptiles, rodents, and small birds. Great Blues are monogamous, and will remain with their mate for the breeding season. Usually only one brood a year is produced; however, a Great Blue may raise another, if the original clutch is destroyed or abandoned. 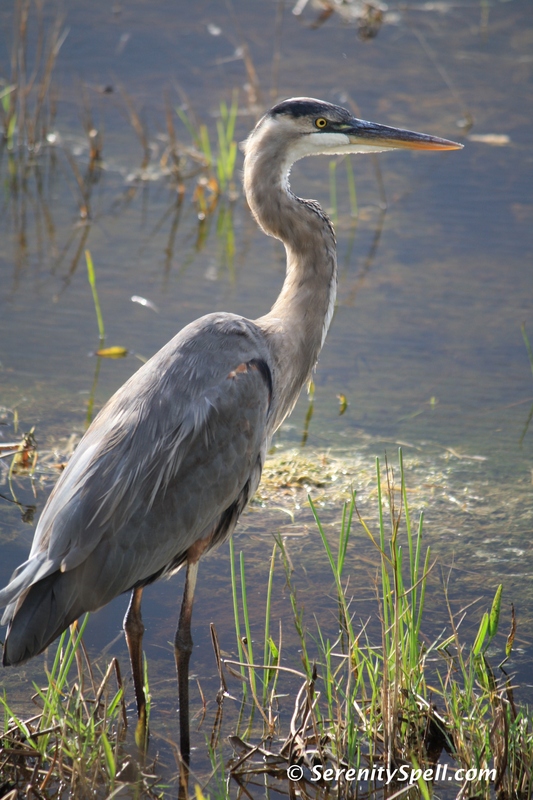 They breed in groups, or colonies, alongside other herons (and egrets). These breeding colonies, or rookeries, are located in all types of trees that can support their nests — in our area, tree islands are the preferred structure for the Great Blues’ rookeries. Tall tree branches or shrubs may also suffice — as long as the nest sits near water or wetlands. They build their nests out of sticks and twigs, and line them with a softer material, such as plants, feathers, or down. Great Blues will try to nest in the same spot each year, using the old nest. Ours definitely do, and defend their nests aggressively against each other as well as against predators. Females lay 2-7 pale blue eggs, which are incubated for about 25-30 days. 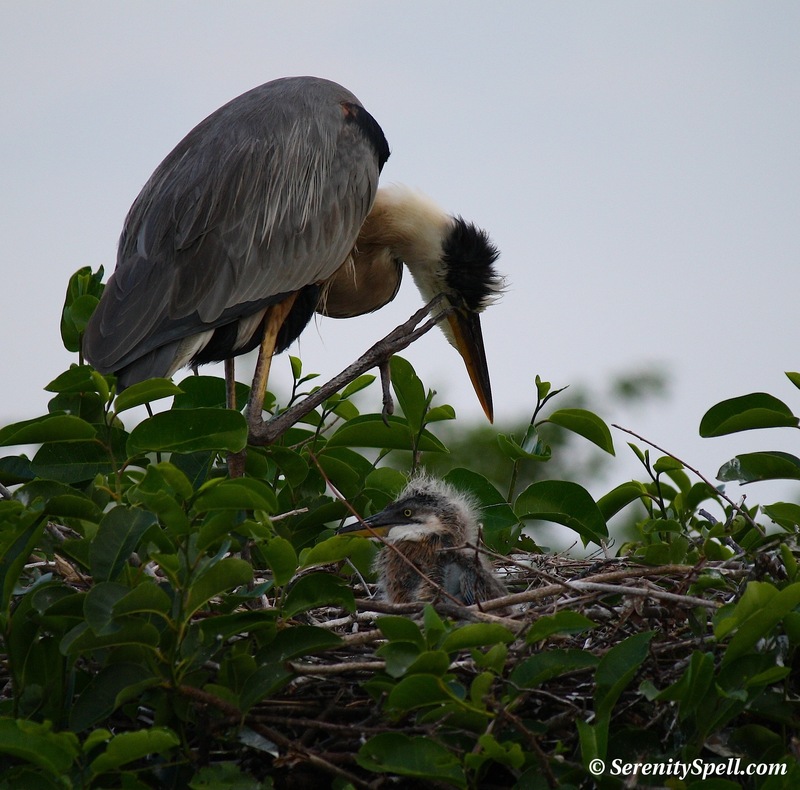 The young hatch over several days, and the Great Blue parents share the responsibility of feeding the young at the nest, by hunting on a full-time schedule and regurgitating the food. The battle for food is brutal among the chicks; the first to hatch is more experienced in food handling, and consequently grows more quickly than the younger hatchlings. Such aggression in the interaction with the sibling chicks (as well as the discrepancy in size) can be seen at the wetland rookeries, where it’s hard not to root for the younger, weaker chicks that are consistently beaten after fierce battles for food. The young Great Blues leave the nest at 2-3 months (60-90 days). 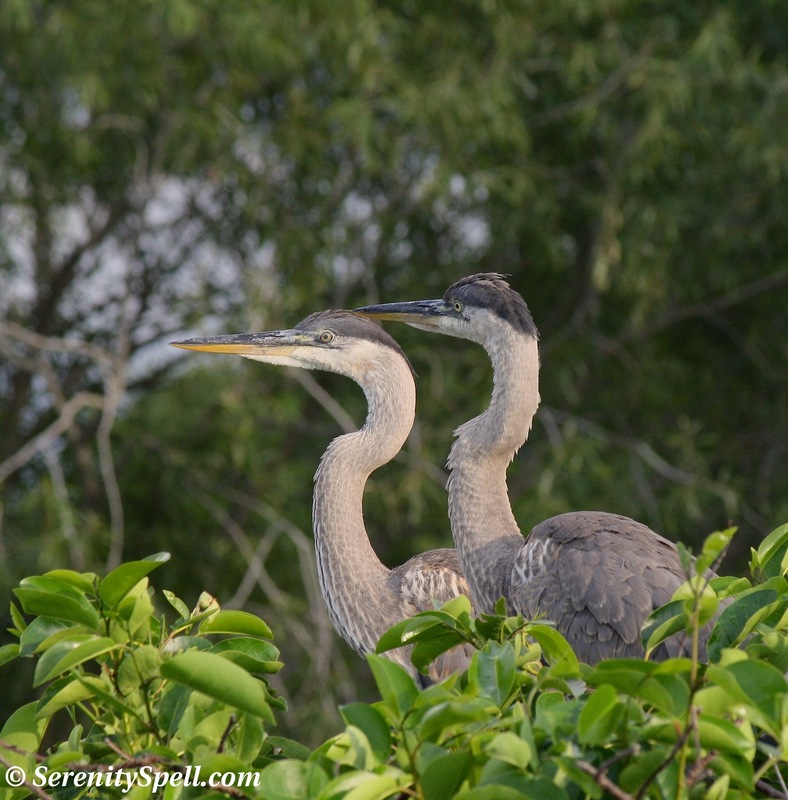 See The Nesting Great Blues for images of earlier nests and the growing young…. The average lifespan for a Great Blue in the wild is 15 years — although a maximum lifespan of 24.5 years has been recorded. Sadly, nearly 70% of Great Blues die before reaching the age of one year; contributing factors include repeated human disturbance to their nesting sites, resulting in abandonment of eggs or chicks. Other factors of premature death include accidents, harsh weather conditions, illegal hunting, and predation of eggs, nestlings and adults. But as mentioned, we’re fortunate that Palm Beach County has created and preserved a marsh and wetland ecosystem for these and so many more animals in Wakodahatchee(Seminole for “created waters”) and Green Cay — so on to the new baby! Oddly, there was only one hatchling at this Great Blue’s nest. I missed this event, but there were several hours of the mother Great Blue fiercely defending her newborn from a Turkey Vulture. …And the same growing baby, one week later! Thanks so much! 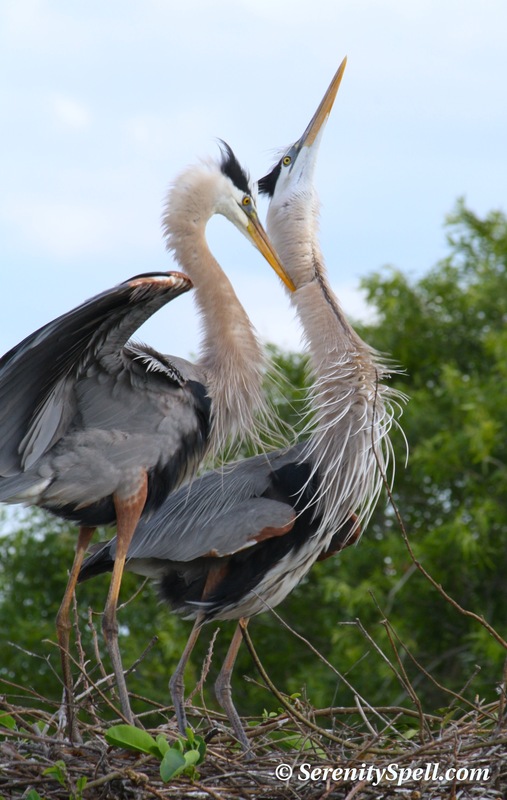 They’re such easy models, here at our wetlands — in the Everglades, it’s a bit tougher. 🙂 You’re so kind! Just gorgeous!!! And very interesting details of the blue heron. Did you know that in Russia there is a belief that if you see a blue heron after the death of a loved one it means that the soul of the love one is thinking of you and bidding you farewell. The next-to-the-last picture conveys an implied communication between the mother and the baby bird. It’s my favorite, for that very reason. 🙂 She was/is exceptionally attentive — seemingly more so than the others. Perhaps because there was only one hatchling; or because of the recent defending of the nest and baby. Their round-the-clock diligence is amazing. Oh, what a stunning post. That shot with the baby is too precious. These are amazing photos. Thanks for letting me visit your wetlands through your photography. I love it! very interesting details of the blue heron. And amazing fotos. Love the one with the baby looking right into the eye of the mother. A fantastic and very emotional shot. Thanks so much for your kind words! That’s definitely one of my favorite photos. There’s a tremendous amount of protection and caring for these young hatchlings, especially this one — perhaps because it was the only one born (or survived) at this nest. Beautiful birds! Your photography and blog are a nice nitch for a place few know about nor give credit to. I want to thank you for visiting and following my blog. I’ll do that same for you! I know where our Great Egrets and Ospreys nest but I haven’t been able to find where the Great Blue Herons hide out with their young. We have several wetland areas here (being near the Everglades)… And it’s interesting. Sometimes, they nest with the Egrets, and sometimes, they go off on their own. I guess it’s a space issue! I hope you can find your Great Blue babies — they’re a sight.